The Florida vote recounts show how, in a close race, illegally cast votes can become a deciding factor. We find that some non-citizens participate in U.S. elections, and that this participation has been large enough to change meaningful election outcomes including Electoral College votes, and Congressional elections. Non-citizen votes likely gave Senate Democrats the pivotal 60th vote needed to overcome filibusters in order to pass health care reform and other Obama administration priorities in the 111th Congress. The Motor Voter laws are a significant factor in non-citizens voting. When a non-citizen with a green card gets a driver license, in many states they are sent a form in the mail to register to vote. You have to assume, that people who receive these forms would think that they are supposed to register and supposed to vote. 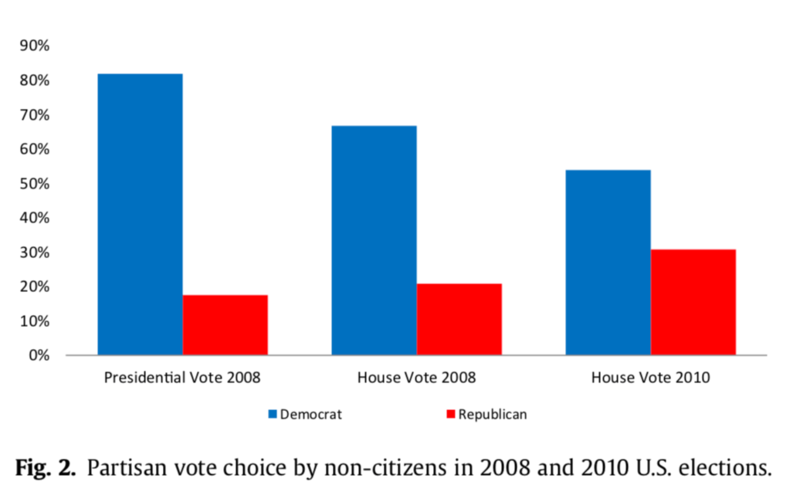 Our results also suggest that photo-identification requirements are unlikely to be effective at preventing electoral participation by non-citizen immigrants: In 2008, more than two thirds of non-citizen immigrants who indicated that they were asked to show photo- identification reported that they went on to cast a vote.